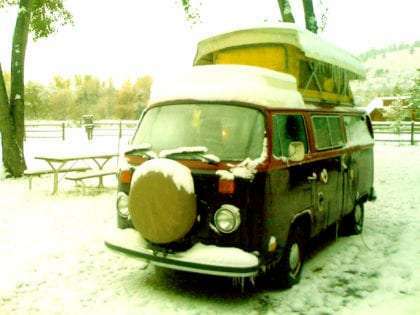 The Bus, naked as she came, pop topped and plugged into an RV park on a river in Loveland, Colorado. naked as she came?? iron and wine fan? It’s wonderful feeling piloting your home, my first full time van home was a new 84 dodge caravan, now here i am 30 yrs later still vandwelling. It certainly is a wonderful feeling!